That looks like one worth checking out. It looks like a really nice option for being able to carry a fairly large knife with the weight of a smaller knife. Richard, that is what really appealed to me with this one. A full size folder, but in a lightweight and discrete package. Thanks for stopping by! You really got my interest with this blade…… for EDC I like under 3oz in a tough package. Now I’ll have to go to my local knife shop and put one in hand – which might seal the deal if it feels good. Thanks for the detailed review. First of all, my pleasure entirely! I think this is a very capable EDC knife just under 3 ounces. Handling one in person before buying is always a great idea. If you get a chance, please let me know what you think of the knife after having a chance to check it out. Thanks for stopping by and leaving the nice comment. I’ve considered one of these for an upgrade for my old frame locks once I’d picked up a 530 mel pardue. The costliness was just too hard to get past at the time. This would certainly be a high end choice if I wanted to replace the griptilian. As usually great review that makes me envious! RK, I agree that this would be a nice high end upgrade to the Griptilian. Practically speaking the price is probably my biggest issue although like I said, $140 is a pretty nice deal for this one considering. Thanks so much for stopping by, always a pleasure. Thanks JT! I am glad your brother likes this one as well, great minds think alike. 😉 Seriously though this is a very well done blade, great design and flawless execution. One of the greats imo. Thanks for stopping by. One more time, you did a great job with this review, making me buy this knife that I’ve been considering for several months… I bought it by internet and I couldn’t handle it before and I’m not disapointed: it feels a little “bigger” and stronger that I’ve imagined; to me it is a very nice looking knife from the handle to the blade (I love the “modified reverse tanto shape”). The only issue is that the blade is not perfectly centered (it is still acceptable, not like what I saw on some Mcusta, but I’m not use to that with Benchmade…) and a little lateral blade play that comes after several openings: it gets better by turning the pivot screw but the problem comes back. I think I’ll have to use some locktite. However, I guess it will became one of my favorite EDC. I apologize for my english, I’m french and don’t write english very often. Thanks so much for the nice comment my friend, I am glad you are enjoying the 940. I would try a little lock tite on the pivot, I usually do that with my axis lock knives and it helps shore up any blade play. And I am also glad you have been enjoying the reviews in general. I’ve got more on the way very soon. Thanks again and all the best. Nice review. My 940 sees more pocket time than any other knife I own. Wicked blade design hiding in a tuxedo! Thanks Craig! Glad you like your 940 too. I just got my 940 Osborne. It fits like a groove on my small hand. Opening however, as my thumb is short, I do have some difficulty but will have to practice a bit there. I am however easily able to open using the axis lock. Do you see any issues with that Dan? I also have noted the matte finish can easily get marks and you have to brush off. All in all, I love this knife and will carry with me on those dressier occasions. Your review was very spot on and those who I have honored with a showing love it a well, especially the purple titanium and quality. It’s a winner. Yes, because the knife is so slim I have noticed that it can be a little awkward to access the thumb studs relative to wider knives in my collection. I don’t have any issues with it per se, but I would agree that it is something of a compromise given the thin profile. From my experience the green finish is pretty robust. It actually marks up a lot of stuff in my pocket (like my cell phone) so I have to be careful with what I include in that pocket. Glad to hear you have been enjoying yours. My Dad EDC’s a 940 as well and he really likes it. I recently acquired a 943 which of course is very similar, but I do enjoy the black handle and clip point blade. Your link dosnt work? Am I missing something? Still $180.00 on website, not the posted 140.00 price!? This article was originally published in 2012. Since then BM has changed some things with their MAAP pricing, and it looks like BHQ no longer offers it at $140. Sorry about any confusion, I’ll go ahead and update the review. thanks for updating it, unfortunately the price now is out of my budget. Than you for the review. I’ve had my 940 for about 8 months now. This knife just shines. You’ve touched on all the obvious points here Dan and I agree. You know what I love about this knife the most? The action. It is my go to knife for what I call ” couch play”. Sitting there. Watching TV. Flicking your knife open and closed about a thousand times? I can’t explain it. The 940 opens and closes with a very satisfying smoothness and ease. It also doesn’t make a huge thwacking noise doing so. Blade is still without any play in it and perfectly centered. It’s one of those knives that at first you are a tad reluctant to use it much. I mean, it’s so beautiful. Eventually I reached the point where I made a conscious decision to USE it for just about everything. I have. It has a few little scratches but still looks great. I keep my Spyderco Sharpmaker on top of my bureau all set up with the ultra fine rids, ready to go. I usually swipe the 940 a couple of times per week with a stropping as well. Maybe 10-20 swipes and another 20 with the strop. It remains capable of shaving hair. I’ve got the blade bug. Big time now. I’ve now got over 60 fixed blades and 70 folders (yes, I’m still married) and the 940 is numero uno as my favorite EDC. I carry a Cadet in my pocket and have for over 20 years now. The 940 isn’t cheap. But after a few months of daily use you realize that you get what you pay for. If you collect knives, IMO this is a must have. I am so happy to hear you have been enjoying your 940. It has been one of my father’s go to EDCs for some time now, for many of the reasons you describe. I agree, the action is exceptional and it has a great feel to it with the solid aluminum handles, long blade, and phosphor bronze washers. Thank you for taking the time out to comment and leave some thoughts on the 940 – I appreciate it, and I know other people who peruse the comments section of the reviews appreciate it as well. I know BM makes quality products, but the ‘street’ price relative to say Spyderco just doesn’t seem to be justified. I simply can’t get myself to pay $180 for a narrow, thin aluminum knife. I don’t see how it would stay in my hand in a self defense situation. So many people seem to be more concerned with how a knife feels in their pocket than how it reels in their hand. I recently purchased a Domino, and consider it to truly be the ultimate EDC as it fits my HAND perfectly and is forgotten about while in my pocket. I would not hesitate to use it in a defensive matter either. Every time I go to buy a knife I look at BM and end up buying Spyderco, Viper or someone else. I agree that $180 is steep for the 940. You used to be able to pick these up for closer to $140, and at that price I think it’s a great buy. It’s still a wonderful knife, but as you noted there is a lot of competition in that price range. Thanks for the great review.I don’t think the green finish is anodized.It appears to be a type of paint.My only complaint about this knife is the finish wearing thru on the edges.It would be nice if Benchmade would refinish the handles but I doubt that is an option.Keep your reviews coming,I sure enjoy them. Thank you, Bob. According to Benchmade it is anodized. I am glad you enjoy the reviews. Many more to come! I finally went and bought a 940BK. If it sold for same price range as a Para2 it would easily be a 5 star knife. BUT at the $195 internet price (I paid about $30 less at a local store) it is basically highway robbery. This will be my one and only Benchmade until their prices get more in line with reality. I agree. $200 for this knife is just too much. I paid far less than that for mine (granted it was used). It’s a nice knife but BM’s prices need to come down to earth. I really don’t think 200 bucks is too much for the 940. After all, the CR small Sebenza is 350 bucks these days and the 940 is, in my opinion, a much better, more ergonomic and, therefore, more usable knife. While Benchmade knives are expensive and I don’t own a lot of them, the ones I own tend to get carried and used more than any other brand. It’s a nice knife. When you compare it to the Sebenza like that it makes sense. However people gripe about the handles being aluminum (instead of titanium), S30V being a relatively common steel, etc. I don’t think they examine it from the utility perspective like you do. I just got one, but mine is pretty stiff, though. It does not open smoothly nor rotates freely. Needs a tough movement to close it. Have you heard of this issue? Could it be a seconds? Antonio: Have you tried adjusting the pivot and / or lubricating it? Typically axis lock knives are very smooth and easy to open. Something isn’t right. Unfortunately I don’t have any tips. Sometimes you only need to back off on the pivot very slightly. You can always re-tighten. If there are significant problems then I would send it in the Benchmade. Their warranty service is excellent. I tried to adjust the pivot and, moving it just a hair counterclockwise and the blade fell free. Now it is working fine. I’ve been EDCing mine for almost a year now and I couldn’t be happier. It just disappears in the pocket. Edge retention has been amazing, just a few passes on my sharpmaker and it’s shaving sharp again. I can’t recommend this knife enough. The only thing is you have to wait for the pivot to “break in” then tighten it a hair and it’s perfect, I put a little grease on mine for good measure. The SV30 blade gets dull very easily. Sorry to hear your blade dulls easily. 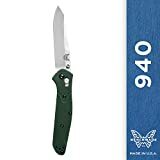 I have had good success with Benchmade’s S30V in the past, so I’m a little surprised to hear this, but I’ve had some S30V blades that have performed better than others. That said, Benchmade’s LifeSharp service is a nice program so I’m glad to hear you have been taking advantage of it. Hopefully your 940 will provide many more years of service.